This is a continuation of my effort to document some of the errors and challenges I faced while making a particular pattern. The first part of it is here. I recalled that I had tried making this shirt before. But I was wrong; it’s a different pattern in that first effort. This is the first time I’ve tried making this shirt; I’m not sure that I like it any better than that one, I admit. But that’s not why I tried making a shirt. 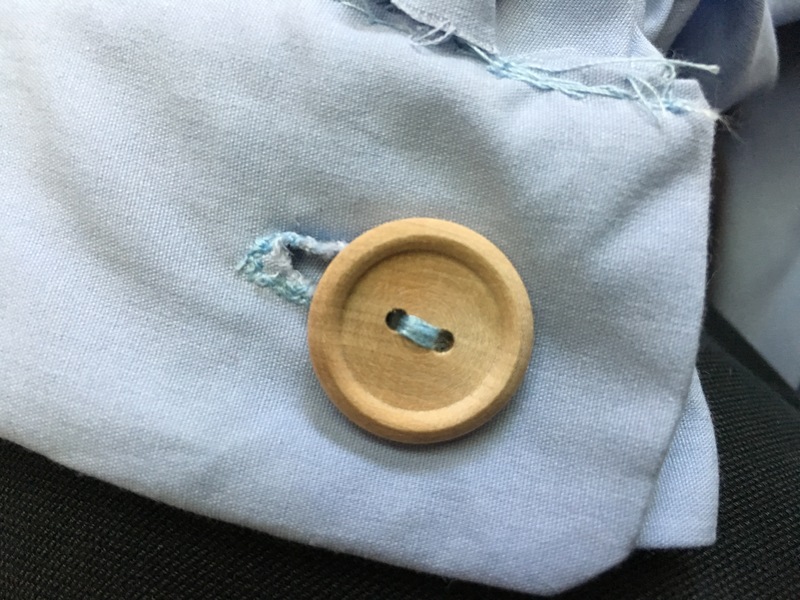 One of the challenges of any shirt pattern is that the key details — buttons and buttonholes, trim on the collar — all come at the end. Any mistake is glaring and obvious. You can ruin the work of two days (or a few hours, for a real professional) just by getting a buttonhole wrong. Fortunately for me, I’ve already made three significant mistakes. I don’t care if I get some details wrong at this point — I want to know the other mistakes I’m likely to make. 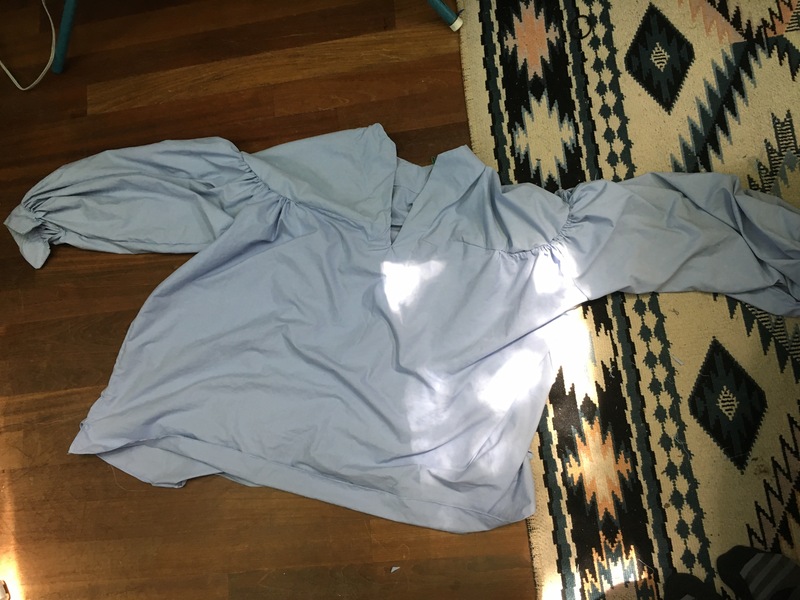 I finish the body of the shirt: front, back, two sleeves, placket, two cuffs (three pieces each). Now it’s all detail work. 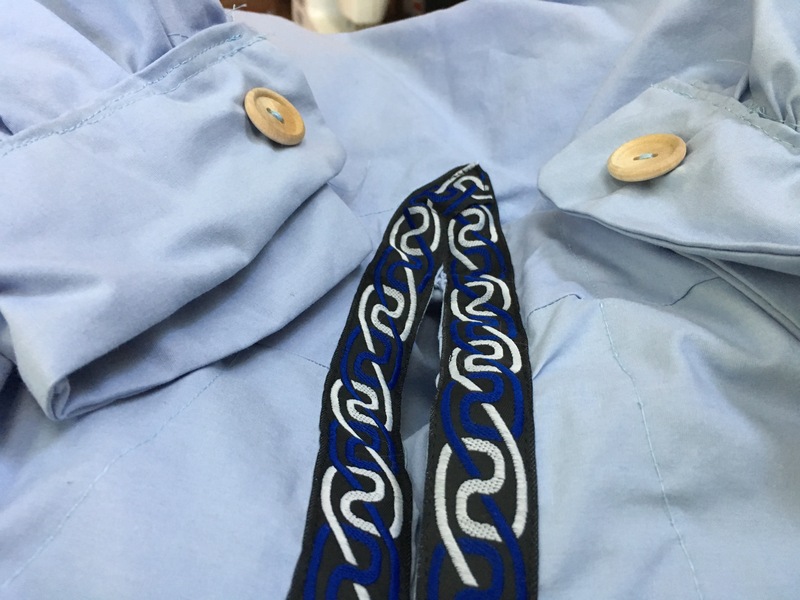 The first photo shows the trim around the neckline and the two buttons on the cuffs. Last step: two buttonholes. A buttonhole on a shirt is a date with death. You can’t do it until the very end; it’s a one-time activity; once it’s cut, there’s no going back. I get the first buttonhole done. It looks like it’s the right size. It measures correctly. Is it, though? There’s something I’ve forgotten but I can’t remember. Something about the height of the button being relevant. I don’t look it up. Button holes already frighten me. I have to face this fear. The garment is already somewhat damaged. One more mistake isn’t going to kill it. 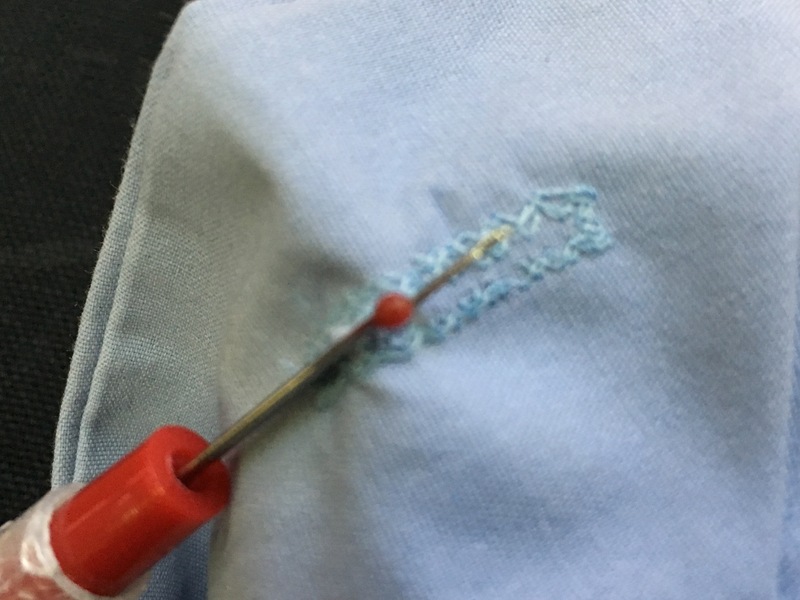 Cut a button hole with a seam ripper. They’re more precise than a blaster, a weapon for a more elegant age. It takes several cuts with the tiny blade in the bottom of the seam ripper to open the hole. It takes a couple of seconds of fiddling to get the button to fit. This is not ideal; it shoild be a smooth thing, not fussy. I will heed advice, but mostly I need more practice. Some of it is having the right tool to mark the fabric. I only have white chalk to mark my lines on fabric; against the pale blue background, the white tailor’s chalk is largely invisible in the light of my studio. I can’t really see what I’m doing. I’m also, probably, rushing. The first button fits the hole quite well although accidentally… It’s a little tight and I should lengthen the next button hole. The process of putting in the button hole stretches the cuff a little. I hear a tearing sound. Is that fabric, or interfacing between the two layers of fabric inside the cuff. No obvious tears, so probably interfacing. Is the integrity of the shirt damaged? No more than it was before, I suspect. 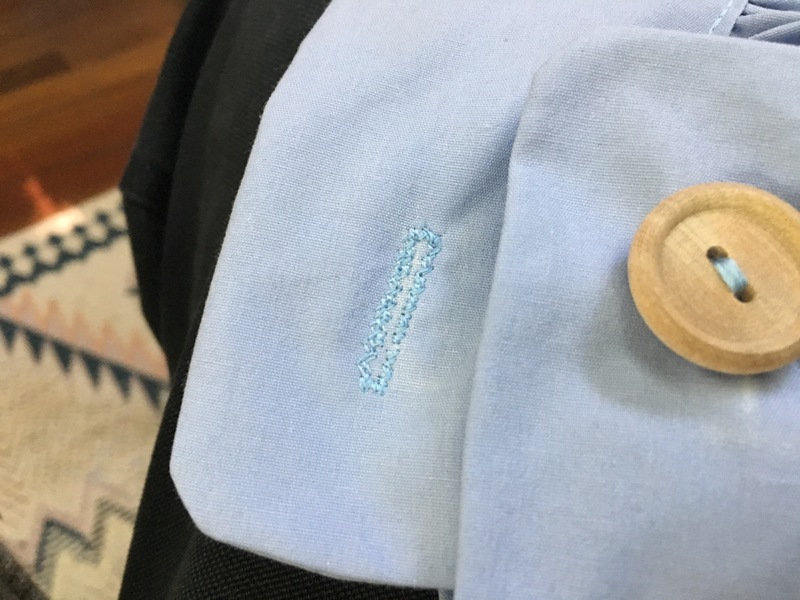 And the shirt’s integrity is already damaged in a couple of places; the gathers around the sleeves and cuffs for one; the placement of the interior placket for another. What next? A second button hole, of course. I’m going to try to get this one exactly right. I get it wrong of course. Instead of a nice narrow rectangle it’s more of a triangular shape. I meant to do that. Right? Right. But the button fits. Not well, maybe, but it fits. The next challenge is hemming the bottom edge. I discover that I have a hemming foot in a case of feet for my low-shank sewing machine, and I try it out. It works — not perfectly, and some of it will require practice. But it works. In the end, I have a serviceable shirt. It’s roomy inside this shirt, and it’s long. Three inches extra would probably have been enough, but now I can belt it like a Anglo-Saxon nobleman, although it’s unlikely that an Anglo-Saxon nobleman would have had a shirt of pima cotton with a 400-thread count, or trim as lovely as this. The gathering at shoulders and across the front has to be right. Reinforce the yoke shoulder seam; reinforce the place where the gathers attach to the yoke. Pin the cuffs, sew the outside, then sew the inside. Maybe do buttons and buttonholes before attaching cuffs? Tricky. Get the point of the trim correct. All in all, a successful first effort at this pattern. I look forward to trying it again, the next time I find myself in possession of a top sheet that can be sliced and shredded in six different ways to make a shirt. Thank you for this. It dignifies my procrastination on two shirts in progress. How do you find Simplicity’s patterns and directions? I have a few patterns from the Simplicity and Butterick. The bathrobe one, which you saw, and men’s pajama pants were ok. The sleeveless shirt looked hokey and weird. I’ve had better results with a couple indy pattern companies. Also, have you found many good sources for men’s patterns? The market is skewed toward women’s patterns and especially toward kids. Your comments on the front gathers reminded me of this Colette tutorial on the benefits of using three rows of gathering stitches. ( Looks like I can’t post the link – google for collettehq and gathering stitches). . I tried them on shirt sleeves and they came out well. Next time I’ll start with a long tail rather than back stitching as they recommend. I found I needed to gather from both sides. Nice to see your projects! Perhaps I shall scheduled a date with death this weekend so I can move one shirt to the Done column. There’s a lot of simplicity costume patterns for men but frankly they’re terrible. I’ve bought some books on patterns and pattern making but the standard for men is the suit jacket, of course — which is a thing of structural sophistication only matched by your typical bomb-and earthquake- proofed skyscraper. They’re not easy. Just reading the directions on a vogue pattern for a suit was deeply intimidating. I like the triple-line gather much better than the double. I’ll have to try that. I’ll also have to look for some Indie patterns. One of the books on patterns that I have is on medieval tailoring: a lot of squares and triangles sewn together makes for a very boxy garment but they’re wearable. However they’re not particularly beautiful. NPR and Planet Money did a kickstarter: buy a tshirt, and they used the money to track a tshirt’s manufacture from raw cotton to tshirt shipped to the kickstarter backers. It was about $14.00 a shirt for 24000+ shirts. The mind blowing number was the six miles of cotton yarn woven into a typical tshirt. Yikes!.